Decorated with sparkly lights and ivory organza draped around the windows this room is light and airy and can seat up to 130 people. 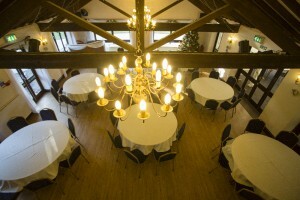 For a more informal party this room can take up to 200 people is overlooking the lake. The Lakeside Suite is on the ground floor with moveable seating and tables. It has its own bar, disco booth and dance floor. Male, female and disabled toilets are situated in the adjoining corridor. 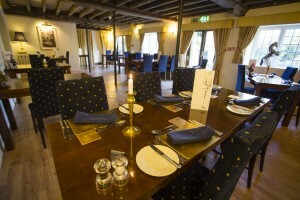 Moveable seating throughout with space for banquet-style dining for small private functions – seats 30. 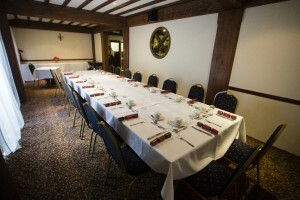 This room is ideal for family gatherings or special anniversaries. The main restaurant has moveable seating throughout. All chairs are upholstered and without arms. It is well lit and airy. The water wheel turns behind a glass partition. This room is perfect for an intimate party up to 40 people. Please note that banquet seating is not suitable in this room, 4/5 round tables for up to 8 people fit comfortably.